Rob Kearney: The space in behind for the opening try was not in his brief. The two nice early incisions in attack were a rare treat as the Welsh continued to test out his fine positioning, He was not found wanting - 6. Keith Earls: The sliding cover of a defence-into-attack kick was calm and the wing tamed a dangerous cross-field kick. There was precious little to gain from in attack, especially with the widespread dysfunction going on inside – 5. Garry Ringrose: He uncharacteristically went for the offload when holding on would have been the better option in his first real carry. It was not a day for painting a pretty picture and the prospective duel with Jonathan Davies - 4. Bundee Aki: Too many times, he was given the ball in impossible conditions. The one time he got away, he never forced the defender to make a decision. He had to forage away without any real dividend – 5. Jacob Stockdale: The wing's first action was to forget about the touchline from his capture of the kick-off. This did little to impinge on his confidence, flying up the left. He was beaten in the air by Biggar in what is still a work-on - 5. Jonathan Sexton: He conceded the first Wales three-pointer to Anscombe. There were a few impressive early touches which became more irregular as the game wore on, underscored by one hoof directly to touch and a dead restart – 4. Conor Murray: The very thing that has separated the scrum-half from everyone else in his slot is his kicking game. By taking that responsibility away, he doesn't have half the influence on Ireland or the opposition, reflected in a bad miss on Gareth Davies – 4. Cian Healy: An early spill and penalty at a maul was not exactly the ideal start. A scrum penalty allowed Wales to build a 16-point lead at the break. Took Thomas Francis out for an irresponsible act – 4. Rory Best: The captain's final championship match was compromised by the weather, placing unnecessary extra pressure on his lineout work. He was never a factor in the give and take action outside the set-piece – 4. Tadhg Furlong: The tight-head was at the mercy of the official at the scrum and jumped the gun for a cheap penalty. The wet, slow ground made him a target to be driven back by the insatiable Welsh defence – 5. Tadhg Beirne: The wonder turnover that denied Wales the possibility of a second try was muddied by a slack penalty for knifing into the maul at the side. The muscularity of the occasion did not play to his strengths – 4. 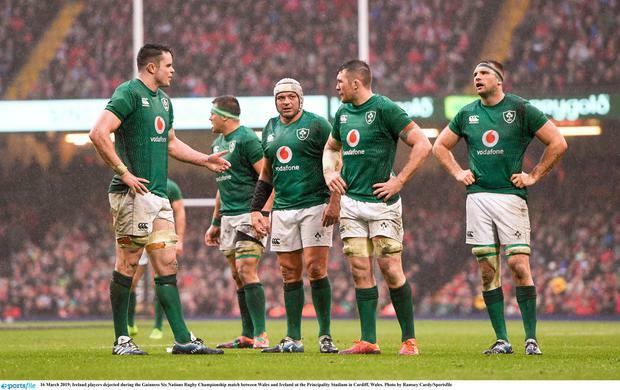 James Ryan: It didn't start well, being pinged for a side entry into the maul. He outfoxed Alun Wyn Jones for a grab against the throw, but didn't do as well on his own as a caller. Still Ireland's best player - 7. Peter O'Mahony: The high flyer had taken more ball at the lineout than any other player in the Six Nations. The malfunction there had little to do with him. The big moments were not there and could not rise above the mediocrity - 5. Sean O'Brien: The decorated flanker is not the player of old. He toiled for every minute without matching his effort with impact. The trademark go-forward was absent and there was no surprise to witness his removed after 51 minutes - 4. CJ Stander: The Welsh targeted the number eight in the same way as England did. His over-eagerness to go for a tap penalty cost Ireland a prime scrum position. Lack of a passing game left him looking one-dimensional – 5. Joe Schmidt: No matter the plan, the decision to opt for a closed roof worked against Ireland's desire for multi-phase attack. Their whole game is based on keeping the ball. That is a hell of a lot more difficult in the teeming rain - 4.